My game has several different types of grass and water. 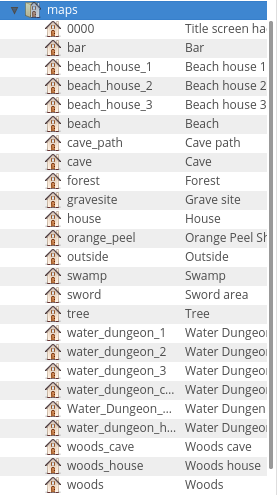 Is there a way to set ground1 and ground2 to a different sprite when entering a different area? I'd also be curious if it's possible to set the direction of the ground based on the hero's direction. eg, when the hero faces left ground2 looks different. Development / How do you organize your quest data files? I've been working on animating an intro sequence for my game, and running into callback hell with movements. Eg, one movement must happen, then the next movement happens, then a timer happens, then another movement happens, etc. The top one looks very promising. Anyone have experience with this? Also just wanted to share in case others find it interesting. General discussion / How loud should sounds be? Development / Has anyone tried compiling Solarus for the web? For example, you can see the open source game FreeDink running in the browser: https://play.freedink.org/ This game is written in C++ and ported to the web with Ecmascripten. I think Solarus would have to be modified for this to work since it reads the filesystem to load the quest and write save data, but it might be possible. Development / Movements automatically change NPC's animation and direction? I'm experimenting with making NPCs shiver back and forth when I use my vacuum item on them. It's a pixel movement that jitters an entity left and right by 2px. I'm guessing that using a movement on an NPC is "smart" and makes the NPC automatically change direction toward the movement and try to walk that way. Am I right? If so, is there an easy way to override it? It's not a big deal, and I might just not do this in my game. It doesn't seem documented though, and kinda surprised me. I've been focusing on menus lately. At first I found them intimidating but I'm starting to get the hang of it now. As a web developer, creating menus by drawing pixels is very weird. I know this is just how games work, though. idk, I haven't fully thought this through obviously, but I'd love to see some sort of component-based design in action. I haven't fully worked out how this needs to happen in Lua.